First spotted on Angelina Jolie’s arm, Louis Vuitton’s ‘It’ bag Capucines sparked curiosity and interest among the fashion elite the world over when it was launched in 2013. Stylish, supple and a reflection of the brand’s ideals of timeless elegance, it is the perfect incarnation of Louis Vuitton’s savoir-faire. 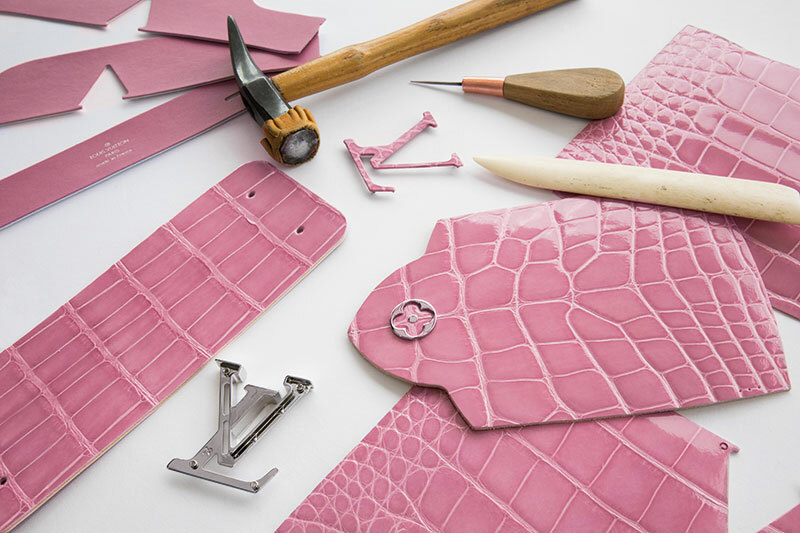 The name of the range pays homage to the location of the first-ever Louis Vuitton boutique and workshop at Rue Neuve-des-Capucines. 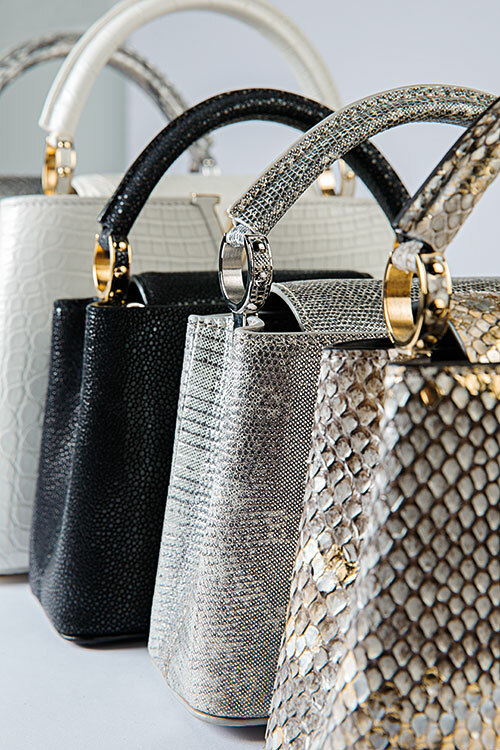 The most distinguished facet of the bag is the variety of exotic leathers used, including python, alligator, ostrich and lizard, with crocodile leading the way. The bag also comes crafted in full-grain taurillon calf leather, obtained from the topmost layer of cowhide that is subject to minimal chemical processing. Stylish, versatile and understated, the collection is available in a matte or polished finish, making it a praiseworthy wardrobe staple. The ultimate example of craftsmanship is displayed through the array of beautiful shades that the bag can be purchased in, plain or shaded, all the while retaining the Capucines trademark of softness and durability. Offering a kaleidoscope of editions in a variety of tones, the bag replaces the iconic Louis Vuitton monogram with minimalist LV initials that are set into the full-grain leather and can be hidden by the tuck of a flap for a subtler look. The semi-rigid handle that is secured by shiny rings opens the bag into two generously sized, useful compartments, once again displaying the brand’s ability to marry style with functionality. 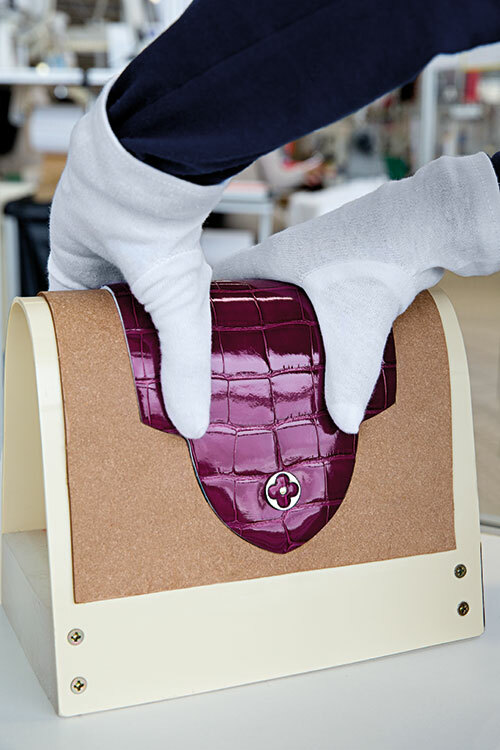 Boasting an admirable design sensibility and oozing sophistication, the bags are a product of over 300 complex steps, all made by hand. It is no wonder then that the Capucines range proves to be a sell-out every time and remains today one of the brand’s most coveted items!